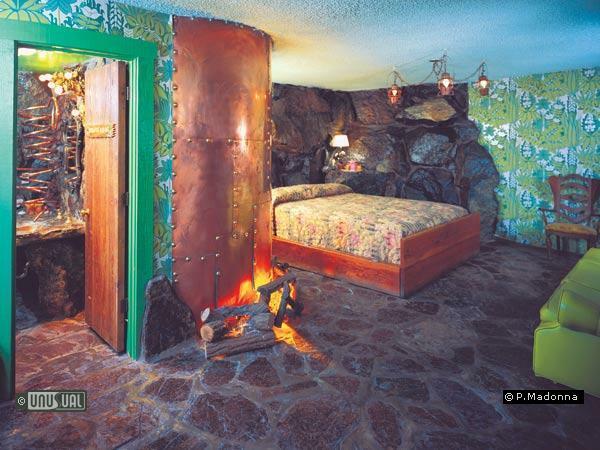 Every room tastefully different, from caveman rooms with waterfall showers to daisy themed rooms. 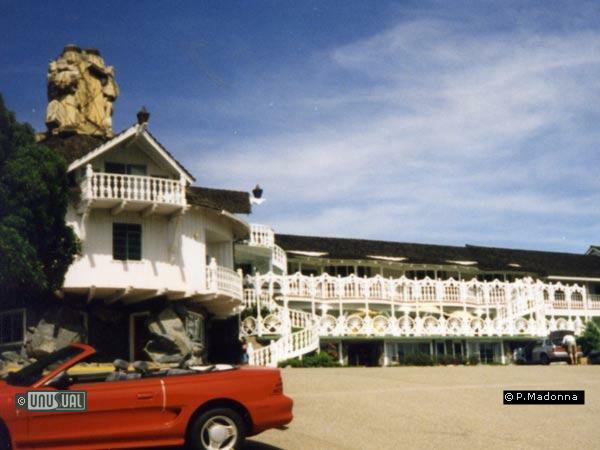 A landmark on California’s Central Coast for over forty-five years! 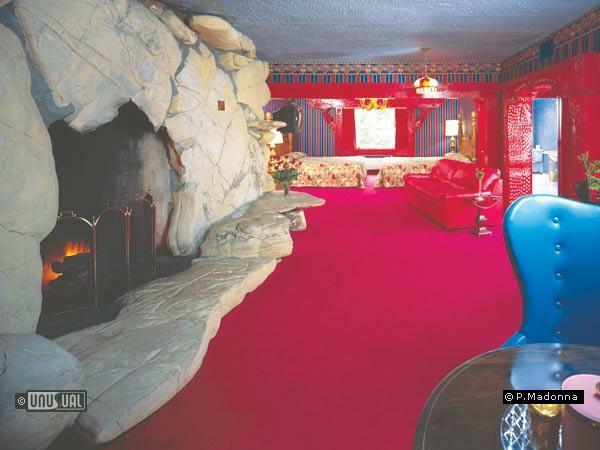 The world-renowned Madonna Inn offers 108 rooms, uniquely decorated with a special theme and color scheme, no two alike! The main building, constructed of large boulders reminds the visitor that proprietors Alex and Phyllis Madonna created this fantasy hideaway by having weekend access to industrial construction and heavy lift equipment. Every one of the rooms and suites are unique. 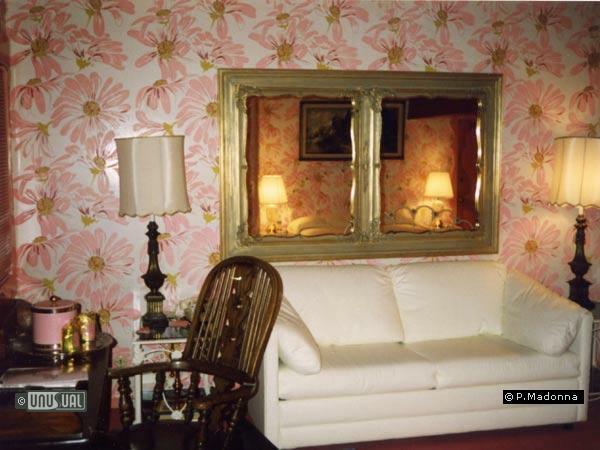 For example, the “Krazy Daisy” room delivered a collage of different daisy furnishings, from bedspreads, floor and wall coverings to daisies on the shower curtain and even in the toilet. 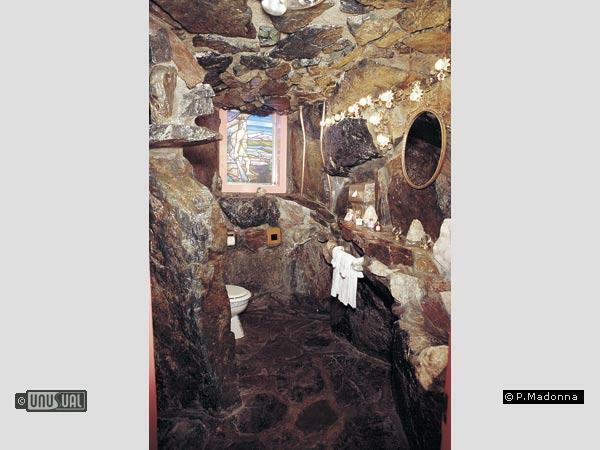 Other suites are even more outlandish with the Caveman suite one of the most famous, including a rock ceiling and waterfall bathroom shower. The tiger print bedspread in this room might not appeal to every taste, but you are guaranteed a memorable stay. 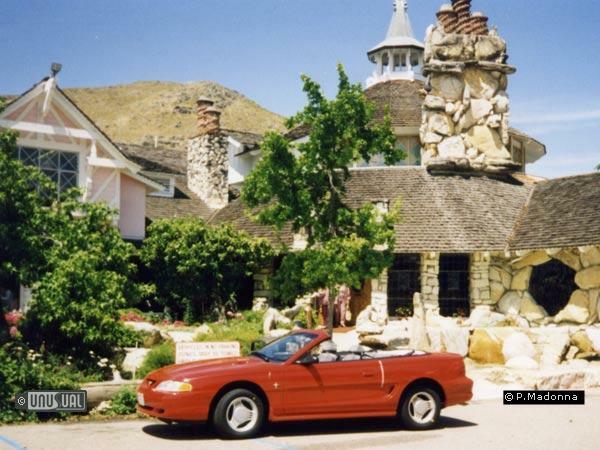 Even the casual visitor for lunch or dinner does not escape the Madonna Inn effect, with public restrooms furnished in an outlandish style. A rock pool urinal and giant clam washbasin for example. The hotel has recently built a pool, fitness center, and massage center complex. Between Los Angeles and San Francisco along he Pacific Coast Highway – a drive which is a destination in itself. Tom Leyde of Salinas, CA contacted the GoUnusual team with his review of the Big Sur River Inn. As many know, we're keen to grow our membership of properties in the USA. However, rather than wait for the team to visit and get a membership pack across to Bir Sur River's GM, Rick Aldinger, we're posting Tom's editorial here for everyone to enjoy. This place is amazing. The pictures here are really old and don't do it justice. 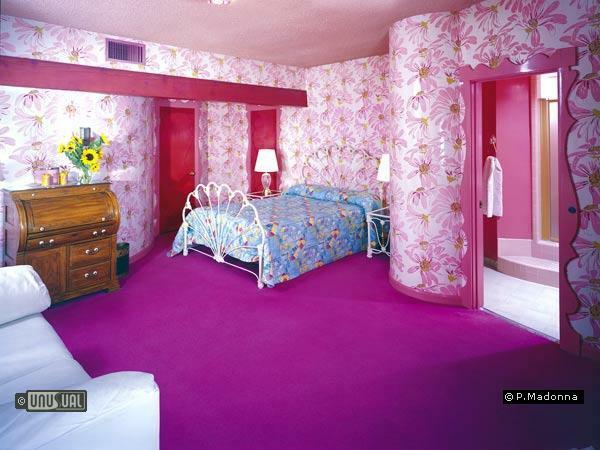 From the heated toilet seats to the twin extra king size beds in the rooms, to the fabulous pink dining room- awesome. 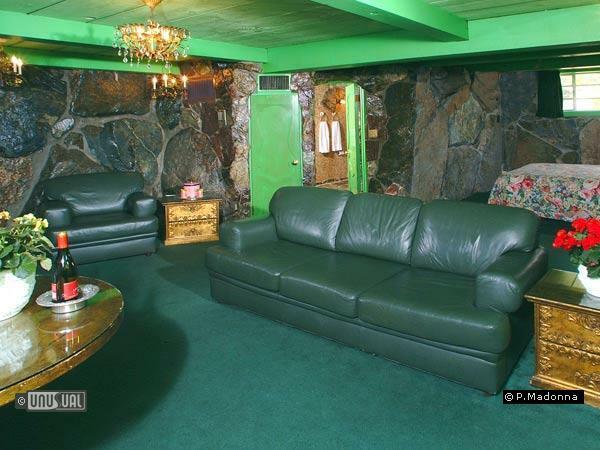 My parents came home from a romantic vacation when I was about 10, raving about this place. I am 43 now, but I have never forgotten the pictures they showed us, and their stories about this magical place! 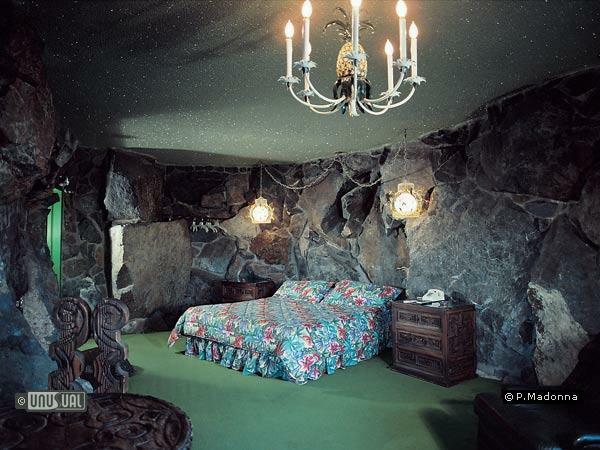 Now that I have seen it in "Unusual Hotels" I want to visit as much as I did when I was a kid, envying the groovy adult world! The pink light posts outside are one of the smallest "unusual" details. The waterfall in the men's room is definitely worth mentioning, but also the different room themes are rather well done... plus, the bar has a very cozy atmosphere with its leather armchairs. In any case, a place to see for a night or two. Any even if you don't stay for the night, the bar is a good place to relax. This is real trip! Words can't describe the rooms. It is worth the trip - just because you cannot believe it's for real! This place is just plain nuts! This is an amazing place, no 2 rooms are the same but the experience is much more than that! The whole place is Mr and Mrs Madonna"s 'baby', everything here is thought about, linked and considered and yet ends up being an eclectic jumbled up mess that feels very comfortable. There is something for everyone no matter what your taste and they go out of their way to make your stay special. We returned there for our wedding anniversary and received a bottle of champers with a celebratory balloon attatched- cheese but you gotta love it! I also love the fact that you can get a postcard of the room you stayed in, genius! The horse and carriage ride around the grounds the wandering Ostriches just add to the whole cheesemonger feel. What an amazing place ! Great for a stopover or just a coffee - even the restrooms are amazing. The handbasins are giant clamshells ! 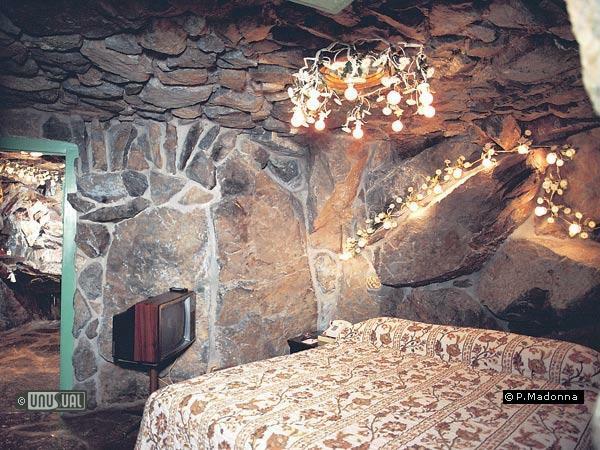 Their caveman room had a real waterfall shower and animal print bedcovers. I stayed in Crazy daisy... and they kept the theme throughout. I think there are over 200 all different rooms. Good loation too - between LA and SFA on the great driving of the pacific coast highway.